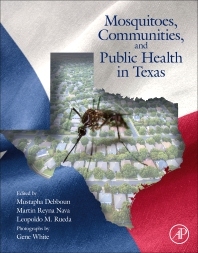 Mosquitoes, Communities, and Public Health in Texas focuses on 87 known species of mosquitoes found throughout Texas. It includes information on the ecology, medical and public health importance, and biological diversity of each species. In addition, it provides detailed identification keys for both larval and adult stages of all mosquito genera and species known to occur in Texas, along a review of surveillance and control strategies. The expansion of invasive mosquitoes from other regions (including Mexico), together with climate change occurrences increase the likelihood for an increase in diseases, such as West Nile Virus, Yellow Fever, Dengue, Chikungunya and Zika. This unique work is the first unified reference and resource rich in mosquito information for medical entomologists, mosquito and vector control professionals, pest management professionals, biologists, environmentalists, wildlife professionals, government regulators, instructors of medical entomology and public health professionals who have disease or vector responsibilities, mosquito taxonomists, epidemiologists, entomology students, academia, pest control industry, and libraries, etc., with utility for medical, veterinary and health professionals. Dr. Mustapha Debboun has a Ph.D. in Medical and Veterinary Entomology from the University of Missouri-Columbia in Columbia, Missouri, and is a Board Certified Entomologist (BCE) with the Entomological Society of America. He has more than 27 years of experience in public health entomology, integrated mosquito management, and mosquito/vector-borne diseases where this work has taken him to over 35 countries in Africa, Asia, Australia, Europe, and South America. He is currently the Director of Mosquito & Vector Control Division at Harris County Public Health in Houston, Texas. He has published over 120 peer-reviewed scientific articles and co-edited three books: Prevention of Bug Bites, Stings, and Disease; Insect Repellents: Principles, Methods, and Uses; and Insect Repellents Handbook. Dr. Debboun organizes national and international symposia, serves on eight journal editorial review boards, and a reviewer for six scientific peer-reviewed journals. He is also nationally and internationally recognized for his extensive work on arthropod repellent research and development. Martín Reyna Nava has an MS Degree in Medical Entomology from the Universidad Autónoma De Nuevo León in Monterrey, Nuevo León, México. Currently, he is the Technical Operations Manager for Harris County Public Health Mosquito & Vector Control Division where he has worked since 1999. He is responsible for the Avian, Mosquito Surveillance, and Virology Programs. Mr. Reyna has authored and co-authored several scientific research papers on arboviral disease vectors including: “A Taxonomic Checklist of the Mosquitoes of Harris County, Texas” in the Journal of Vector Ecology. Dr. Leopoldo M. Rueda has a PhD in Medical Entomology from North Carolina State University, Raleigh, North Carolina, USA. He was a former research entomologist and chief of the Walter Reed Biosystematics Unit (WRBU), located at the Smithsonian Institution, Maryland, USA. He developed numerous interactive identification keys for mosquitoes and phlebotomine sand flies worldwide and is involved in international collaborative research on the biosystematics, surveillance and control of mosquitoes, and related arthropods of public health importance. He has published more than 100 peer-reviewed journal papers, in addition to book chapters, technical bulletins, and other scientific publications. He has conducted numerous international training courses on the taxonomy, identification, surveillance and control of mosquitoes and related arthropods worldwide.